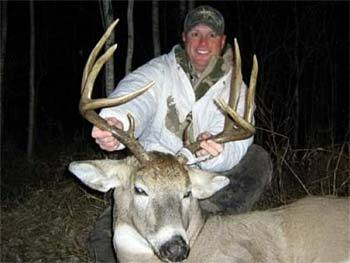 Woodland Outfitting Company offers trophy whitetail, black bear and waterfowl hunts in the Carrot River area of northeastern Saskatchewan. Woodland Outfitting Company is a family effort which includes owner and head guide, Mike Woodward and his wife Joyce, who looks after the lodge and makes certain that everyone gains weight! Woodland Outfitting is now offering trophy elk and bison hunts as well as their well-known trophy black bear, whitetail and waterfowl hunts. Our guides are like family - they are avid hunters and genuinely good people. They will do everything possible to make your trip a memorable, enjoyable experience. They are mature family-oriented men with strong morals and values who I am proud to call friends. We are located on the forest fringe of North East Saskatchewan. Our hunting and fishing is virtually untouched. The deer and bear in our area have no hunting pressure and grow to be giants! The area has produced monster whitetails, HUGE color-phase black bear and more Canadian Geese than one could count! We also have walleye and northern pike fishing that is world famous! We offer all this and more. We offer exclusive trophy hunting and fishing, and modern lodging - all at affordable prices with combination packages available. Our equipment is new and modern - including vehicles, trailers, Argo's, ATV's, snowmobiles, and boats. 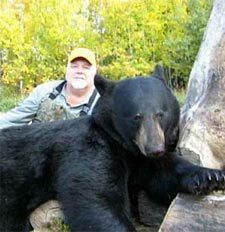 If you are looking for a HUGE color-phase black bear - look no further than Woodland Outfitting! Our large area has little to no hunting pressure and our bears get old and BIG! We keep our baits full and we run a TON of baits to ensure the greatest opportunities for our clients! Experience some of the finest whitetail deer hunting that Saskatchewan has to offer! Our area has produced MONSTER whitetails over the years - the genetics are there! Combine this with the fact that there isn't any hunting pressure on these animals! Our area is huge - we offer excellent opportunities for trophy game! For more information on available dates and price quotes go to the Woodland Outfitting Company's web site below. To book a hunt now call: 306-862-4517 or E mail.